Updated Friday January 27, 2017 by Stan Dorsey. Are you ready to laugh for a good cause Smithfield Little League families? Save the date and book a babysitter for what promises to be a great night with Funny 4 Funds. 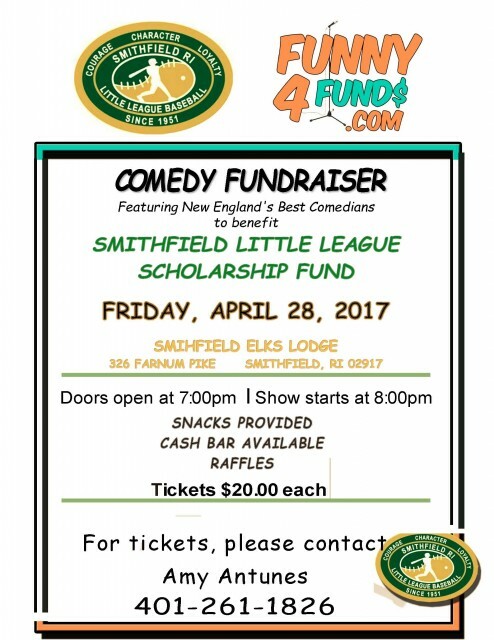 On Friday, April 28, at the Smithfield Elks Lodge, the league will host an adults-only comedy show to help raise money for the Smithfield Little League Scholarship Fund, which provides financial assistance to former Smithfield Little Leaguers entering their first year of college. Doors open at 7 p.m. and the show begins at 8 p.m. Tickets are $20 a person. Unable to attend, but would still like to support the fund? Click here to make an online donation. For more information or to purchase tickets contact Amy Antunes at 401-261-1826 or amy.antunes@gmail.com. Click below for full details of the event.